If you are in search for a beautiful outdoor haven, look no further than Grand Bayou Resort. Located in the heart of Coushatta, Louisiana, Grand Bayou Resort is the ultimate escape from the hectic hustle and bustle of everyday life. We have curated and maintained over 2,800 acres of natural landscape, creating an endless amount of opportunities for all types of outdoor entertainment, like camping, boating, fishing, and hiking. 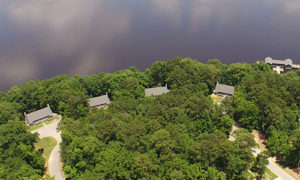 Grand Bayou is the embodiment of Louisiana’s famous nickname, “Sportsman’s Paradise,” by functioning as a resort as well as a campground with the purpose of accommodating overnight stays. 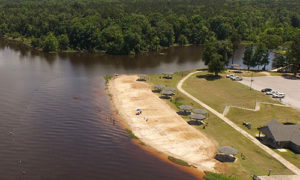 Whether you need a quiet, secluded getaway or a place to feel the rush of excitement in the water, Grand Bayou has you covered! Lodges, cabins and RV sites. Tubing and Skiing on the southern side of the Reservoir that is cleared of trees and stumps. 7,600 sq. ft. partially covered concrete pier is a fisherman’s and picnicker’s dream. A huge marina for your boating needs. White sand beach and swimming area that includes bath houses and beach cabanas. Automatic keypad-operated gate provides easy in and out access to the resort after hours. Events Center for family reunions, weddings and corporate functions. Give us a try. You won’t be disappointed. Call now for reservations.